VISINE® TIRED EYE DRY EYE Relief is formulated with GentlePUR™ Technology, a unique blend of 3 moisturizers that soothe, restore, and protect overworked eyes for up to 10 hours of comfort. So you can help your eyes stay tuned in—all night long. I used it when my eye feel tired after looking at a screen for to long. Made my eyes feel refreshed and moist again. Love Visine products. It made my eyes feel cool and took away the dry tired feeling I was having. I could stop rubbing my eyes. We'd like to learn more about your experience with our product. Please give us a call at 1-888-734-7648. We're available Monday-Friday, 9AM-5:30PM ET. We look forward to speaking with you. After trying out Visibe Tired eye a couple of times I have come to the conclusion that it works just as stated on the label. I’m always on my laptop or running errands and after being so long staring at the screen my eyes do get tired and irritated. Also, when I’m doing my errands I’m exposed to the rays of the sun and having the Visine Tired eye product on me does bring relieved to my eyes. Very easy to used a few drops does the job. I’m pleased with the product and I highly recommend it. When I first tried it I didn't notice a difference but without noticing it my eyes were not tried and tired after about 10 minutes after first use. I have been using last couple of days when I first notice my eyes to bother me and WOW what a difference. Thank You for allowing me to try the product would have never known. I never have bought anything for my eyes and now I will be a faithful buyer and recommend to family and friends and who I see in the aisle to buy anything for their eyes. Visine Tired Eye eyedrops really does work on tired and dry eyes. I play games on my phone and tablet all the time, so my eyes get very dry and irritated. This particular Visine helps my eyes feel more lubricated and less tired. I highly recommend this product. The best eye drops on the market! I really liked the fact I did not have to use it over and over like I do with other brands.Cosine Tired Eye is the bed eye drops I've used and I've tried many.I've tried other drops for other purposes but it did not help with my tired dry eyes but these are absolutely perfect.I will never purchase any other brand ever again.I've found THE ONE! 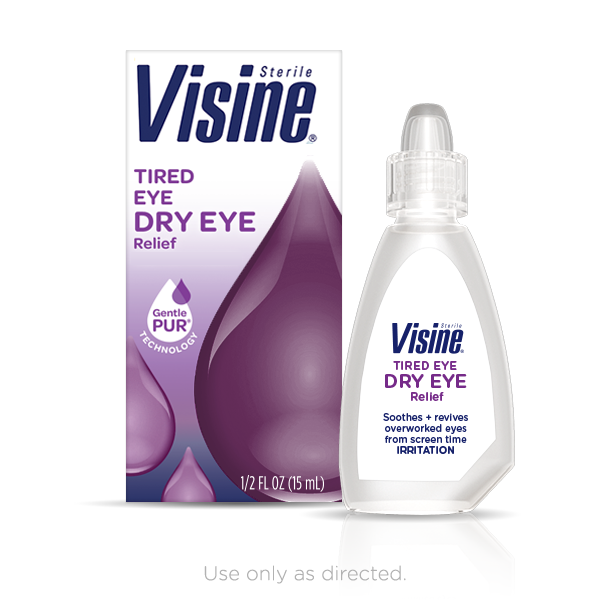 This Visine Tired Eye product was very nice to use. It was soothing and unlike some other products that often sting at first when my eyes are dry. This drop has longer lasting lubricant that protects from further drying. I really enjoyed using this and keep it close to my desk at work.